Hugo Rafael Chávez Frías, or Comandante Chávez, as he was affectionately known by his supporters and followers, passed away on March 5, at 4:25 p.m. local time, following a 21-month battle against cancer. When he died, at 58 years of age, he had become one of Venezuela's and perhaps even the world's most important contemporary leaders, having launched what he and his movement called the "Bolivarian Revolution," named after Simón Bolívar, the 19th-century independence hero who had liberated Venezuela and four other countries from Spanish colonial rule. Chávez was a devotee of Simón Bolívar, and his vice president, Nicolás Maduro, recently referred to Chávez as "the new liberator of the 21st century." Whether this is a fair assessment only history will tell, but what is certain is that Chávez changed the face of Venezuela during his 14 years as president. Regardless of whether Chávez was the new liberator of Venezuela, he did leave a tremendous legacy, and with many achievements, but also with some unachieved projects. Among the unachieved projects are getting rid of inefficiency and corruption in the public administration and lowering the country's high crime rate. The persistence of these problems probably help explain why Chávez got reelected in October 2012 by a margin of only 55 to 45 percent, a smaller margin than his resounding victory 2006, when he won with 63 percent of the vote. That he was able to win reelection after 14 years in office and despite massive opposition from the country's old elite is no small achievement, however. This achievement was possible because Chávez accomplished more than most people realize. In the area of his foreign policy, Chávez was perhaps the most important driving force for regional integration. He greatly expanded an oil program for the Caribbean, known as Petrocaribe, where island nations receive oil and oil infrastructure at highly preferential financing rates. He then launched, together with Cuba, Bolivia, and later Ecuador and Nicaragua, among others, the Bolivarian Alliance for the People of our Americas, known as ALBA, which is a counter-model to the predominant free trade agreements of the region and would promote trade on the basis of solidarity and cooperation instead of competition. He was also one of the main forces behind the establishment of the Union of South American Nations, UNASUR, to which all South American countries belonged. And, most recently, he helped launch the Community of Caribbean and Latin American States, CELAC, which is a regional body that includes all countries of the Western Hemisphere except the United States and Canada. One of the consequences of this integration process has been to end the isolation of Cuba. Finally, he was also one of the world's most vocal opponents of U.S. foreign policy, vociferously rejecting U.S. wars in Afghanistan, Iraq, and Libya, and opposing Israel's attack on Gaza. For that he became one of the Arab world's greatest heroes. Another important accomplishment that is often overlooked is that Chávez served as an inspiration for voters and politicians throughout Latin America, who began voting for leftist parties and leaders throughout the continent. He inspired people because he was one of the few politicians who said what he thought and who acted on what the said without hesitation. In this sense he began a project of reinvigorating socialism in 2005 when he declared himself to be socialist and when he subsequently launched a new political party, the United Socialist Party of Venezuela, PSUV. The reinvigoration of the socialist project was important because he made clear that he espoused a 21st-century socialism, by which he meant a socialism that would be participatory and fully democratic, in contrast to the 20th-century state socialism of the Soviet Union. But what, exactly, did this Venezuelan path to socialism consist of? For one thing, Chávez placed an important emphasis on creating a more equal country. As soon as he came into office he strengthened discipline within OPEC, which raised oil prices within a year of his being elected. Next, he increased oil production royalties on the country's public and private oil industry and nationalized large parts of the private oil industry. With the tremendous boost in oil revenues, he was able to launch numerous new social programs, one after the other, having to do with the eradication of illiteracy, providing elementary, high school, and university education for the country's poor, giving financial support to poor single mothers, expanding and increasing retirement benefits, providing neighborhood doctors to all communities, introducing a comprehensive land reform program, and, most recently, launching a massive public housing construction program, among many other social programs. As a result of these policies, inequality decreased so much that Venezuela went from being the country with one of Latin America's greatest income inequality to the one with the least income inequality. Also, he managed to reduce poverty by half and extreme poverty by two-thirds. Another important accomplishment was the introduction of participatory democracy in Venezuela. This project, which is still incomplete, has put over 30,000 communal councils in charge of their own neighborhoods, so that people feel like they have a stake in their future like never before. This feeling is born out in opinion polls about what Venezuelans think of their democracy, where Venezuelans rate their democracy more favorably than citizens of almost any other country in Latin America. Also, a larger proportion of Venezuelans vote and participate in political activities than anywhere else or at any other time in Venezuelan history. No doubt, Chávez was also a controversial figure, who could count on complete love and devotion from his followers, but who was also hated by many. The love and devotion came from Chávez's charisma, his ability to identify with ordinary Venezuelans and their ability to identify with him. His folksy style, his willingness to sing traditional folk songs, and his ability to tell stories, endeared him to millions. At the same time, his working-class style, his unhesitating condemnation of the U.S. government, his roughness in condemning his political opponents, and his willingness to go after economically powerful made him the target of hate and undying opposition of many in Venezuela's middle class, but especially of its upper class. Of course, the fact that private mass media was involved in an unrelenting campaign against Chávez for most of his presidency caused plenty of fights. One of the perhaps most delicate and controversial aspect of his presidency was his government's human rights record, which groups such as Human Rights Watch, Reporters Without Borders, and the Inter-American Human Rights Commission repeatedly condemned. Many, though, believed that these attacks were mostly unwarranted, exaggerated, or opposition-manipulated distortions of what was actually happening in Venezuela. How did Chávez come to be such an important figure? What brought him to the world stage? He was born in a small town in one of Venezuela's poorest rural areas, in the town of Sabaneta, in Barinas state, the second of seven siblings. His parents were schoolteachers in the town, and Chávez described his life there as one of relative poverty. Growing up, he was fascinated with baseball and at first wanted to become a professional baseball player. However, for kids from Barinas, the only possibility of playing baseball regularly was in the military, so he joined the military at age 17. Chávez became radicalized during his time in the military, where he participated in an unusual program that provided Venezuelan military officer education in civilian universities. Also, his encounters with Colombian rebels along the Venezuela-Colombia border, his witnessing of poverty in different parts of Venezuela, and his exposure to Juan Velasco Alvarado, the left-populist military leader of Peru in 1974, whose works he read eagerly, further radicalized Chávez. Witnessing corruption and abuse of power within the military, Chávez made his first foray into conspiratorial politics in 1977 when he founded a secret military grouping with the military. His group would later morph into the Revolutionary Bolivarian Movement (MBR-200), and then into his political party, the Movement for a Fifth Republic (MVR). A key event in Chávez's radicalization happened in February 27, 1989, when Venezuelans took to the streets in partly violent protests against the neoliberal economic adjustment package that the International Monetary Fund had imposed on Venezuela. Chávez's group within the military was not ready to take action yet, and, worse yet, the government sent military into the streets to violently repress protests, killing anywhere between 300 and 3,000 Venezuelans over the course of four days. These riots and subsequent repression accelerated the plans of Chávez and his co-conspirators to overthrow the government that was responsible for these massacres. And three years later, on February 4, 1992, they were ready. However, word of the military rebellion, or coup, leaked to then-president Carlos Andrés Perez, and he was able to have Chávez and his men arrested. Chávez became famous during a brief television appearance that the president allowed him, in which he took responsibility for the rebellion and said that his effort had failed "for now." Those words, "for now," sparked the hope of poor and frustrated Venezuelans and impressed them tremendously, also because Chávez was the first Venezuelan leader in recent memory to take public responsibility for a failure. He was sent to prison, but remained there for only two years. When Rafael Caldera was elected as president in 1994, he fulfilled a campaign promise to release Chávez because he knew that Chávez's cause enjoyed large popular support. After leaving prison, Chávez spent the next three years traveling the country and got to know exactly how his fellow citizens were living. It was in the course of these travels that Chávez realized that he had popular support and decided to run for the presidency. He ran against a candidate of the country's old elite and won a resounding victory of 56 percent, one of the largest margins in Venezuelan history. His time as president was very tumultuous. He started out with support from sectors of the country's business class, but alienated this sector almost immediately when he refused to appoint anyone from that circle to his cabinet. He then introduced a new constitution in 1999, followed by new elections in 2000 and a slew of new laws that reformed numerous aspects of Venezuelan society, from agriculture to oil, to fishing, banking, and insurance, among many others. These actions proved to be too much, and the opposition mobilized to topple Chávez via a coup. On April 11, 2002, with the help of dissident military officers, they succeeded briefly, naming a businessman, Pedro Carmona, as interim president. The coup, however, was reversed within two days because Chávez's supporters would not quietly accept the coup as the country's old elite had hoped and come to expect. Chávez's presidency would go on to be challenged on numerous fronts, in late 2002 with a shutdown of the country's all-important oil industry, in 2004 with a recall referendum, and in 2005 with an opposition boycott of the National Assembly elections. Finally, by 2006, when Chávez won reelection with an overwhelming margin of 63 percent of the vote, the country seemed to become more normal again. It was not until mid 2011, when Chávez unexpectedly announced that he had been diagnosed with cancer, that the political landscape began to shift once again. 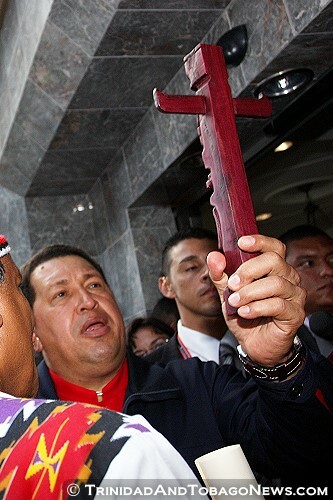 Chávez seemed to recover from cancer and his treatment and went on to win another reelection in October 2012. But shortly after his reelection, he practically disappeared again, only to announce, on December 8, 2012, that the cancer had reappeared and that he had to return to Cuba again for a major operation. December 9, on his way to Cuba, was the last day that he was seen in public. Chávez leaves a gaping hole in Venezuela's political and social landscape, but he also leaves a legacy that his successors will have to build upon and expand upon. Gregory Wilpert a German-American sociologist who earned a Ph.D. in sociology from Brandeis University in 1994. Between 2000 and 2008 he lived in Venezuela, where he taught at the Central University of Venezuela and then worked as a freelance journalist, writing on Venezuelan politics for a wide range of publications and also founded Venezuelanalysis.com, an english-langugage website about Venezuela. In 2007 he published the book Changing Venezuela by Taking Power: The History and Policies of the Chávez Government (Verso Books). He moved back to the U.S. in 2008 because his wife was named Consul General of Venezuela in New York. Since returning to the U.S. he has been working as an Adjunct Professor of Political Science at Brooklyn College.